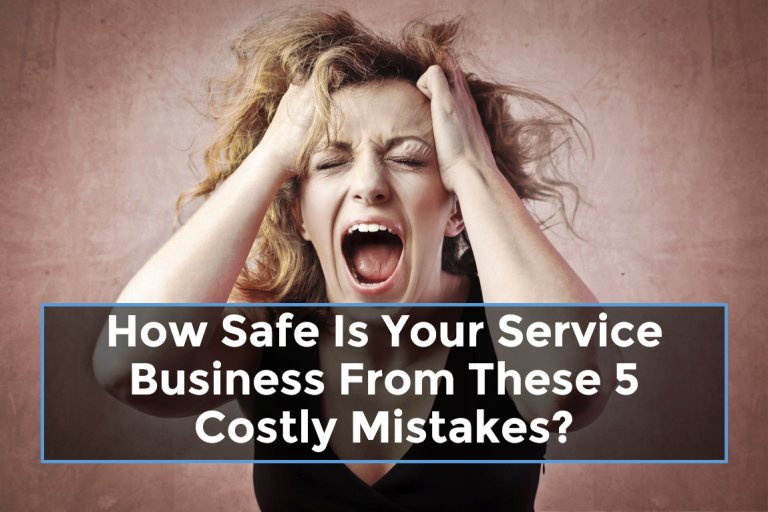 How Safe Is Your Service Business From These 5 Costly Mistakes? If you feel that you’re not doing some things right in your service business, here’s your chance to fix them. Here are 5 costly mistakes to look out for. We all make mistakes. And oftentimes, we’re always waiting for a secret solution that’ll help us solve everything. You’re probably thinking this post contains a secret that will solve all your problems. Finally, you’ll get to fix the problems you’re facing in your business. No, this post is not your knight in shining armour either. If you feel that you’re not doing some things right in your service business, here’s your chance to fix them. You’ll also get to recognize other mistakes you’re probably making too. So let’s get to it…here are 5 mistakes to look out for in your service business. Do you have a laid down strategy, or do you think things up then implement? The downside of this is when something goes wrong, you won’t really be able to point out the reason. And you’ll tend to go in several directions at the same time. On the other hand, a laid down strategy gives you focus. It reduces overwhelm and helps you track your results. Now don’t look at the word strategy like it’s alien. It simply explains how you plan to grow your business…nothing more. A strategy document shows you how you plan to achieve your different business goals and what to do at each step of the way. Without having this written down, you’ll go after every shinny object you see. What are you in business for – to make money or to help people? When will you hit your first million- within your first month of launching your business or after a bit of hard work and patience? A lot of us expect too much from ourselves when we start out. Then when reality hits us midway, the future starts to look not so bright anymore. Like every other thing in life, building a successful business takes time. When I first started out trying to rebuild my freelancing business, I did it with a wrong mind-set. I believed I’d hit it big within the first few weeks being that it wasn’t my first time as a freelance writer. I was so wrong. I was made to understand that it’s really not how fast your move, but how well. However, this is no excuse for slow progress. Can you see the potential in what you do? Do you know your worth as a professional? Are you willing to sell yourself for peanuts? As the “builder” of your business, you determine how it is perceived. You determine how much your service is worth. You determine the kinds of clients you work with and the ones you reject. You determine the kinds of products you want to sell to your list. On a daily basis, through your service business, you interact with people – your clients, your audience, and internet users generally. The higher your business grows, the more people will want to take advantage of it. When Brian Clark had a sizeable audience on Copyblogger, he started getting product offers and partnership requests. But he rejected all those that weren’t a good fit. And even when the proposal came to buy his blog, he turned it down. You’re the boss. So start calling the shots. You need people! Just because you can render your services on your own doesn’t mean you can do everything on your own. If one person (just you) can make $1,000 a week, two can make $10,000 a month. How about 3? Or 6 people? Danny Iny’s Firepole Marketing blog is a living example. When Danny first started, it was just him. However, having a team of 20 has helped him build a business that makes over $1 million dollars annually. Working with people also involves building partnerships. There’s a lot you can achieve and a lot of money to be made when you partner with other people in your field. You not only make them friends, but also have access to their own audience and pool of contacts. This is how product launches work like gangbusters. It’s something I’ll definitely explore in mine. You don’t just sell services…you’re selling a dream that a client wants. But do you believe in that dream? Or are you just out to trade your skill for money? Your belief in what you do determines just how long you’ll run that business, and just how interested you’ll be in it. The world is full of businesses that have no purpose. They just exist to make money. When Steve Jobs was brought back into Apple Inc. to grow the company, he made it a point of duty to create products according to a purpose they believed in. Steve Jobs believed that people can change the world. So, Apple products were created for people who believed they could change the world. Years after his death, Apple Inc. is still regarded as the most valuable tech company in the world. And it’s not just because they make computers. What’s the reason behind your service business? Why do you do it? What’s your reason why? Look deep with yourself and provide answers to these questions. It’s never too late to fix mistakes, including the ones mentioned above. If you’re just starting out, you’re in luck. Starting your business with the right mind-set is super important. And having a solid strategy would help you know how to price your services, the kinds of products to develop and the kind of relationships to build at every stage. What do you think? What other mistakes do you think people make early on in business? Share your thoughts in the comments.